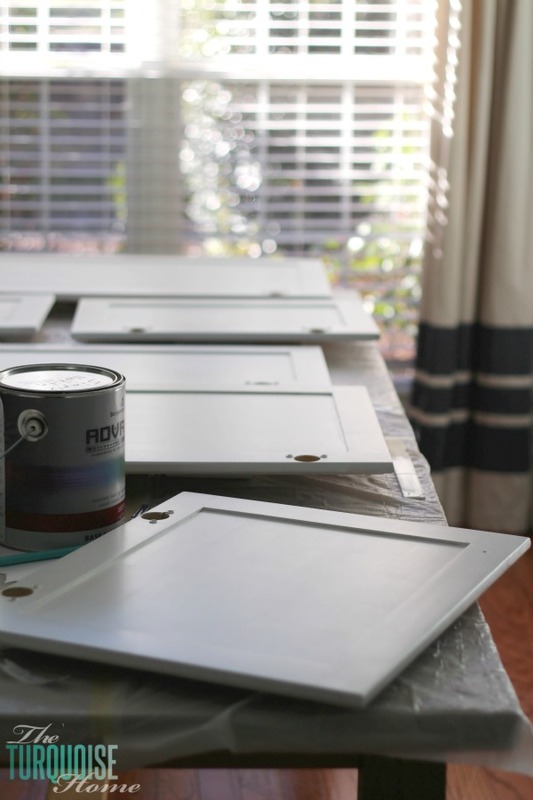 How to paint kitchen cabinets without professional equipment isn’t hard when you follow these easy DIY steps in this full tutorial. I’m so excited to finally have them finished! 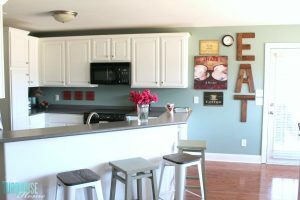 These DIY painted kitchen cabinets changed the entire look of my kitchen with a little elbow grease and minimal financial investment. I would do it again in a heartbeat for these amazing results! First of all. 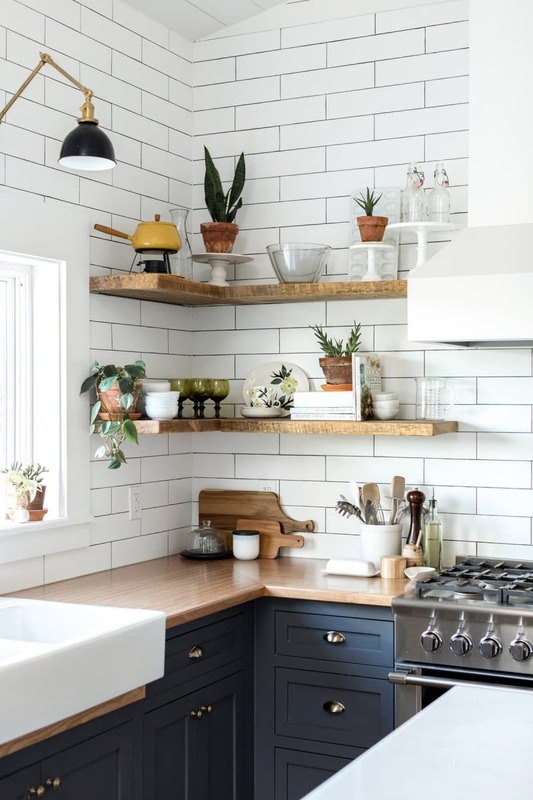 Before we get into this in-depth tutorial on how to paint kitchen cabinets and transform your old, tired space into a fresh and amazing one, let me just warn you. 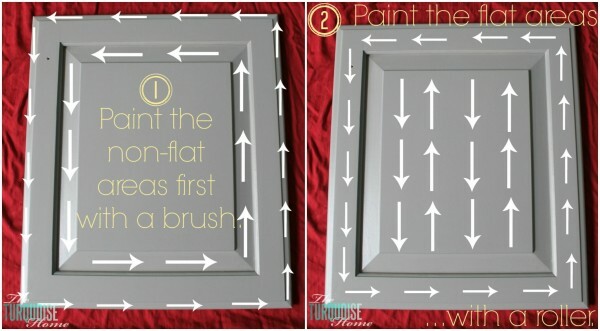 Painting your kitchen cabinets it a whole lot like childbirth. There is lots of labor. Lots of swearing. The commitment will take you longer than you expected, further than your DIY abilities can even imagine. BUT! Big but. 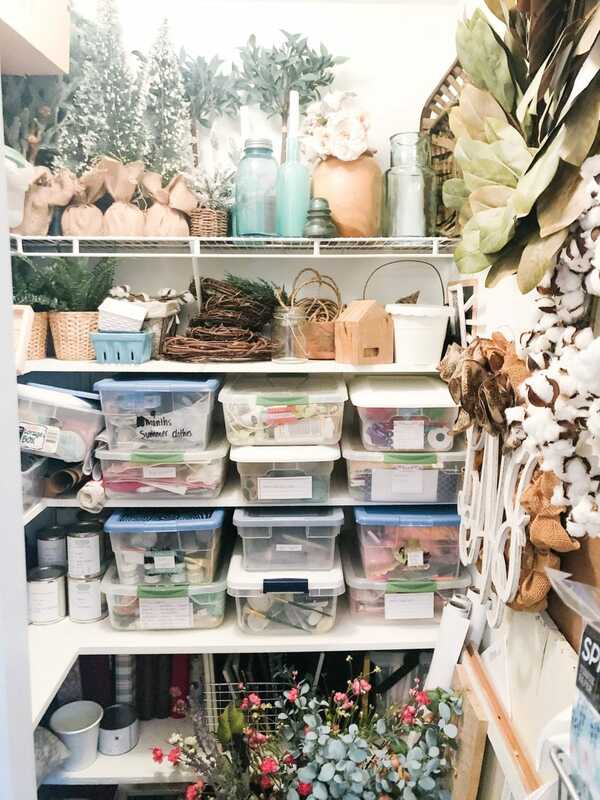 At the end of the whole thing … when those big, beautiful, gorgeous, freshly painted cabinets are staring back at you, you will forget it all in a wave of hopeless love. It’s true. All of the anxiety I’d built up for so many years, thinking about how difficult it would be to paint my kitchen cabinets, was all valid. But I’m here to tell you, that even though you will curse my name during the process, the end result is more than worth it. I have written about painting cabinets before. I did a few things differently this time, so I’ll share a whole new tutorial here. And I’ll share the differences as we walk through the process. First, let’s talk timeline. I did not paint the insides of my cabinets. So, this timeline is the time it took me to remove all of the doors, prep them, paint them and then prep and paint the outside of the cabinet boxes. It took me about 4 weeks of working solid during nap times and after the kids went to bed. My mom came and helped me one day (and she is a hard worker). And then my husband helped me hang them back up. Other than that, I did this all on my own. I did hire a babysitter to come every afternoon one week because I needed to get them finished before Christmas. 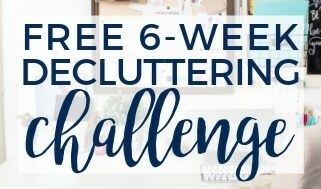 So, if you’re a stay-at-home mom who is going to be tackling a small/medium sized kitchen, then plan on it taking you 4-6 weeks. 🙂 Just to be on the safe side. Or you may be super woman and finish them in a weekend. Just don’t tell me OK? It’ll hurt my feelings. 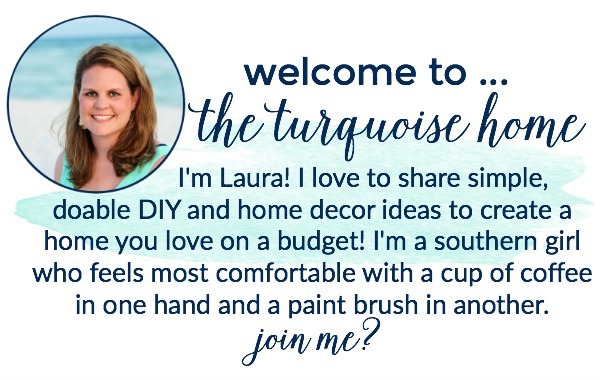 OK, here’s what you’ll need to paint your cabinets with a roller and a brush like me. (Grab a cup of coffee, because this one’s a long ‘un.) This post contains affiliate links for your convenience. See my full disclosure policy here. Before we dive into the steps, here’s a big tip. I get asked “what kind of paint to use on kitchen cabinets?” all the time, so this should help! The paint that you use when painting your cabinets it HUGE. Do not cut corners when it comes to your paint. The first time I painted cabinets, I used Door, Trim and Cabinet paint from Ace Hardware. It’s amazing, y’all. It was the only cabinet paint I’d ever used, and it went on smooth, didn’t leave brush strokes and has a durable finish. 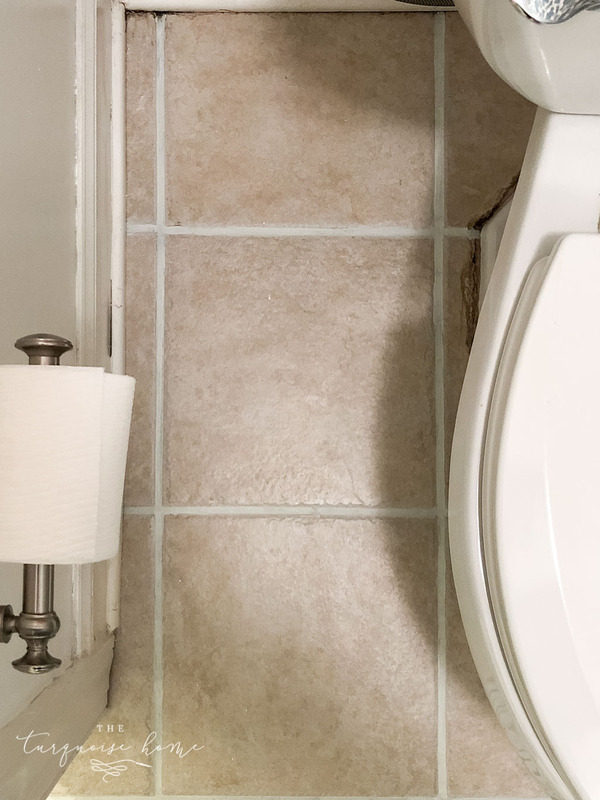 To this day there are no chips on those bathroom cabinets. 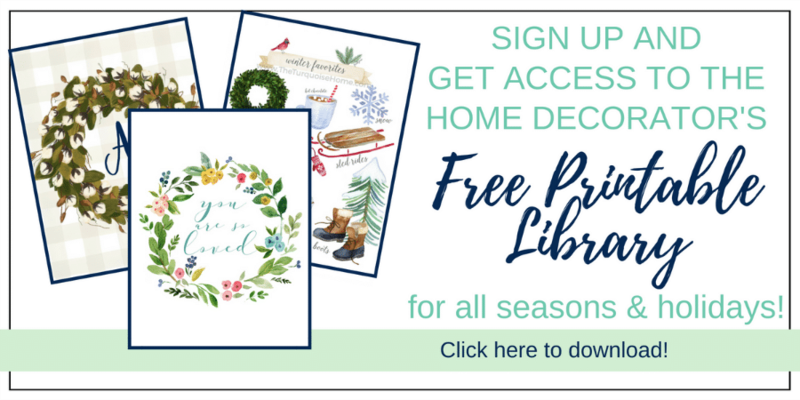 At the time that I painted my bathroom cabinets, I was working with Ace Hardware on their blogger panel. My store didn’t carry that kind of paint, so the corporate office had it shipped to my store. Long story short, I’m not on the panel anymore and I tried to find the paint at a new Ace near my home. The new store didn’t carry it, and we couldn’t quite figure out which kind of base to order, so I went with another kind of paint I’d heard recommended many times. I chose Benjamin Moore’s Advance Paint. OK, great. Two high quality paints. I’m sure they are almost exactly the same. Kind of, but not. Bejamin Moore’s Advance Paint: It is not as thin and dries much faster that Ace’s paint. After two coats on my doors, you can see some brush strokes in the beveled parts of the door. I need to paint a 3rd coat on them. And when I do, I need to add a paint conditioner like Floetrol. I just assumed that BM’s Advance paint would be like Ace’s paint. But that was my mistake and I should have tested it first. I hope that a 3rd coat with the paint conditioner will help correct some of the issues. And maybe I will sand them down a bit before doing the 3rd coat. Final thought: I think BM Advance is a fabulous paint, but if you use it, I would highly recommend adding a paint conditioner like Floetrol to your paint (mix according to the directions on the bottle). Choose your paint color and paint and purchase it. I chose Simply White by Benjamin Moore for my color, and I only needed 1 gallon. Then round up your tape, sander/deglosser, drop cloths, degreaser, brushes and rollers. 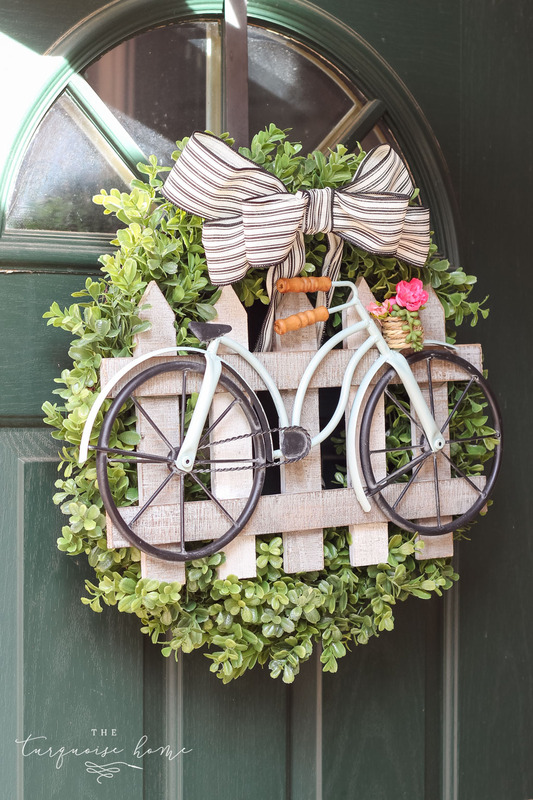 You’ll also want to clear a space for painting. I used my garage for the sanding and priming (because it’s smelly) and I brought the doors and drawers inside to my dining room for painting. I also moved some of my kitchen appliances into the office. 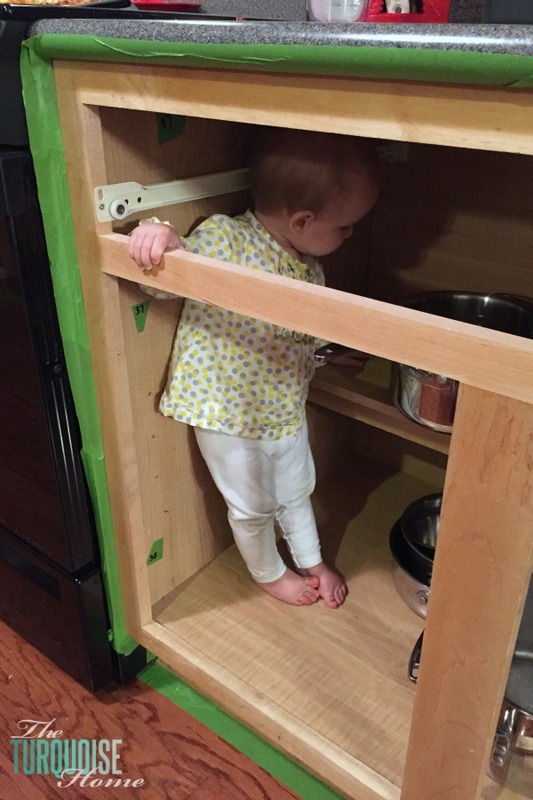 I have a 1-year-old, so she was playing in the bottom cabinets the whole time the doors were removed. It was just easier to have them mostly cleaned out. Now, you DO want to do a little extra prep work when removing your doors and hardware to make reinstallation easier. Putting cabinet doors back where they belong can be problematic if you don’t note where the door goes exactly. Trust me. When they are all laying in a pile in your dining room, they kind of look (mostly) the same. 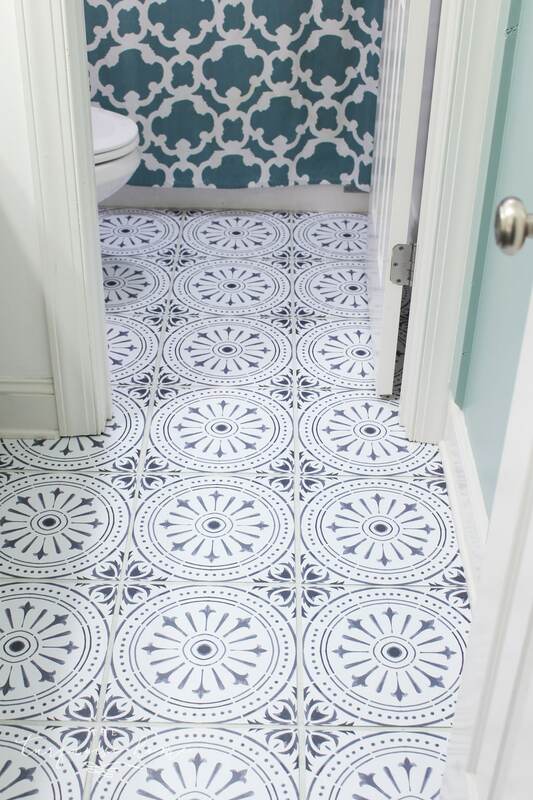 Choose a starting spot in your kitchen/room and number your doors as you remove them. I wrote the door number under where the hinge goes and put a piece of tape over it. That way if you get paint down in there, it won’t matter. Just peel back the tape to reveal your number! And then I labeled the inside of the cabinet with a coordinating sticker. I actually numbered each hinge as you can see on the stickers below. If you are painting your kitchen cabinets, especially, you will need to give the cabinets a good cleaning with a degreaser. I used some organic, natural stuff from the store for a general wipe down and some lemon essential oil for the really sticky stuff. The rubber stoppers on some of my doors and drawers had disintegrated to leave a sticky mess! I had no idea how dirty my cabinets truly were. They were nasty. You don’t want 3-year-old spaghetti sauce residing under your pretty new coat of paint. Do not skip this step! 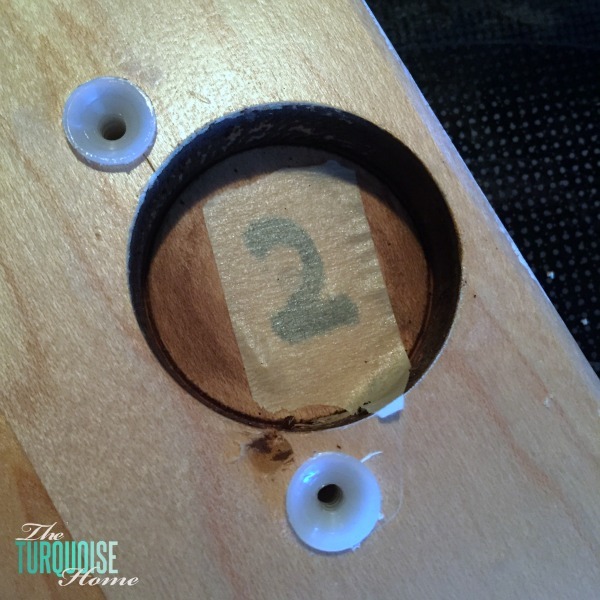 If you’re changing out the hardware on any of your doors or drawers, you’ll want to fill the holes with some filler (this is my favorite) and then sand them. 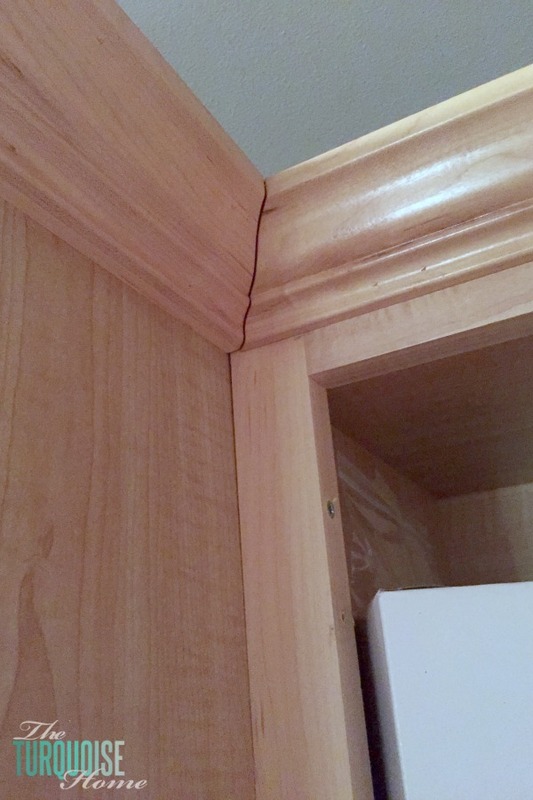 If your cabinet boxes, doors or drawers have any cosmetic or structural issues, fix them now. I had a drawer where the drawer front was coming off. A few minutes with my brad nailer fixed that problem. I also caulked any cracks in the corners and filled any holes in the toe kicks. 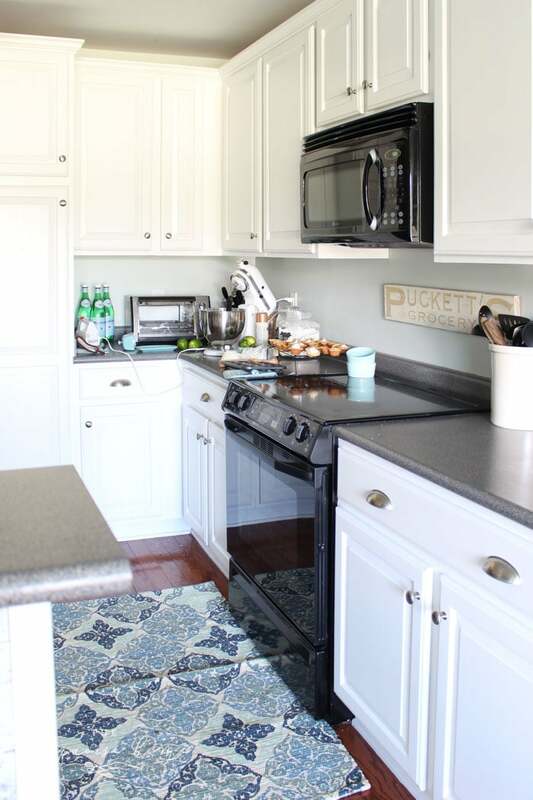 It’s much easier to see any holes or cracks when the cabinets are white, so take the time to make them look nice. 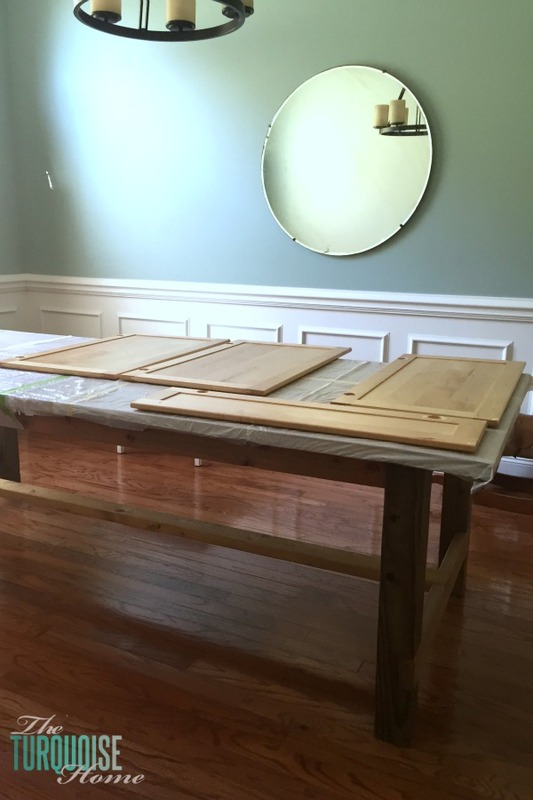 You’ll want to sand all of the doors, front and back with a finishing sander. Trust me, you’ll want an electrical sander. You do not want to do this by hand. 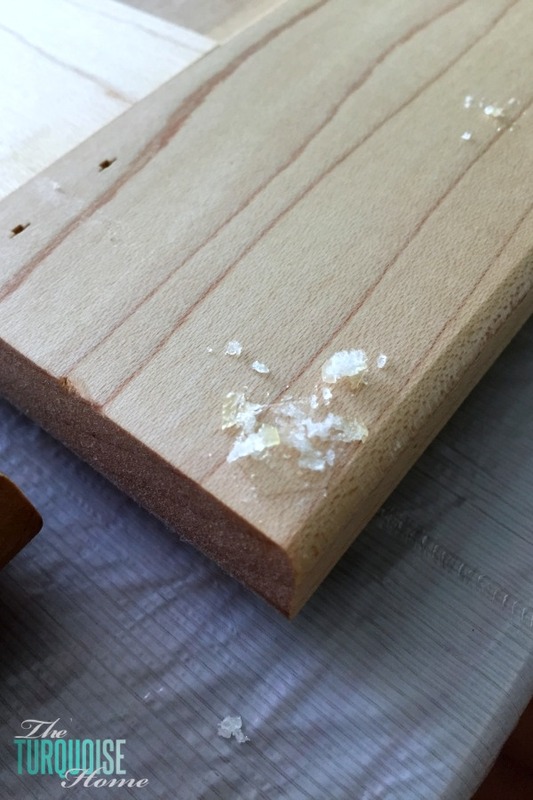 Change your sandpaper fairly often, because you don’t want to spend a ton of time sanding and it’s not really working. You’ll use lots of sandpaper, but it’ll be worth it. 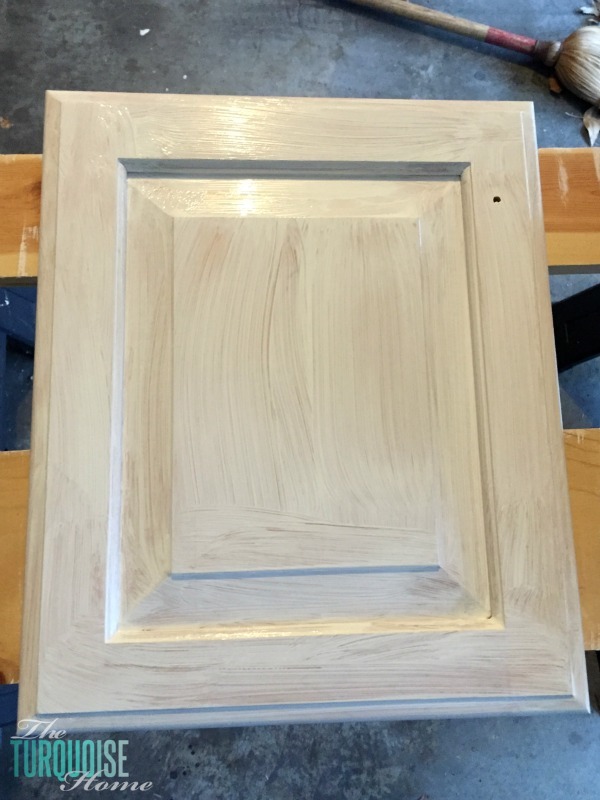 Don’t try to get down to the raw wood, just rough up the slick finish so that the primer can grab onto it. I use a medium grit sandpapers for this step. Wipe them down with a tack cloth when you are finished sanding. I didn’t want to remove everything from the cabinets. I didn’t want to have to seal off the rest of my house or clean up sanding dust for the rest of my life. So, I chose a liquid deglosser instead. Let me tell you, it’s smelly stuff, which means lots of nasty chemicals. You just wipe it on your cabinets and let it dry. Don’t wipe it off before painting. Y’all just be warned. The chemicals are so strong. I was wearing the recommended rubber gloves when applying it, and when I was almost done I noticed that my hand felt like they were burning. I took my gloves off and I had a rash all over the tops of my hands. I assume it was the latex from the gloves mixing with the chemicals in the deglosser and causing a reaction on my hands. Blech. The deglosser works fairly well, but I think sanding is better. I would probably do the deglosser again (to save time), but just apply it in stages so my hands wouldn’t break out. But I will say that I’ve seen some chipping on my cabinets where we hit them when putting away dishes. I’ve not had any chipping on my cabinet doors, so it makes me wonder if it’s the deglosser that made the difference? 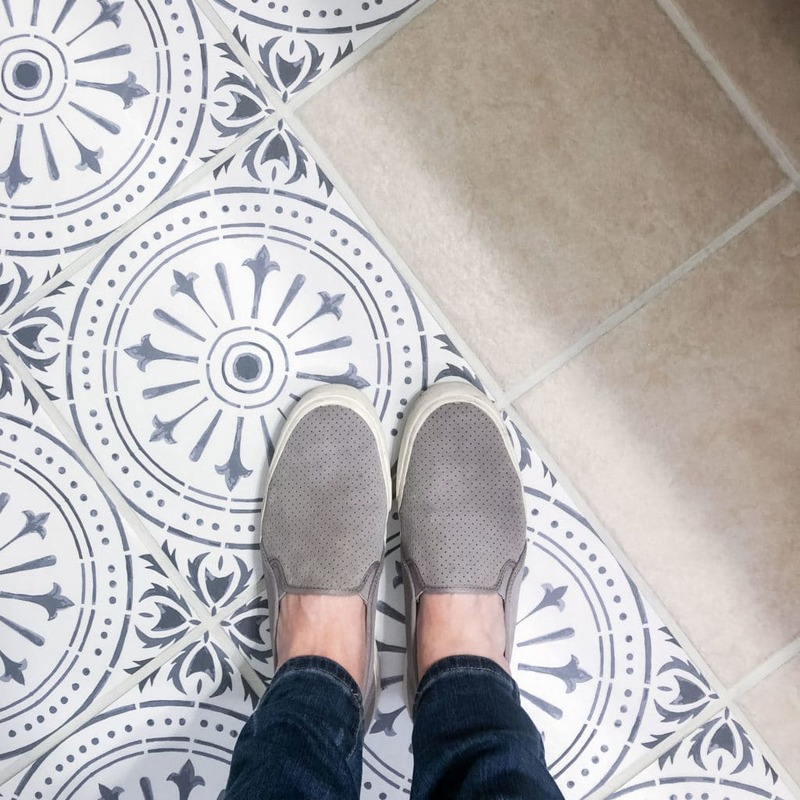 Now that everything’s all fixed, sanded and filled, grab your painter’s tape and start taping off all of the floors and walls inside next to the cabinet boxes. Can you see why the prepping takes forever?? Since primer is oil based, I use a cheap, throwaway brush and a foam roller. 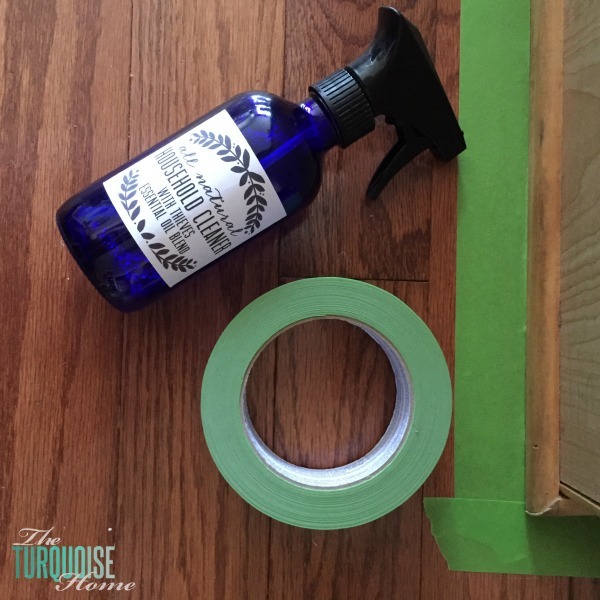 Check out this post to find out how I get a beautiful, smooth finish without spraying them! 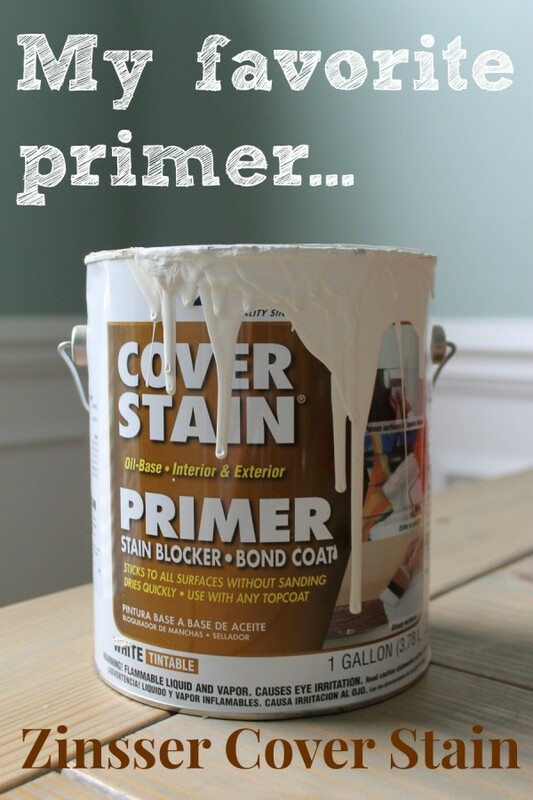 My favorite primer is Zinsser’s Cover Stain primer in the photo above. It is awesome. 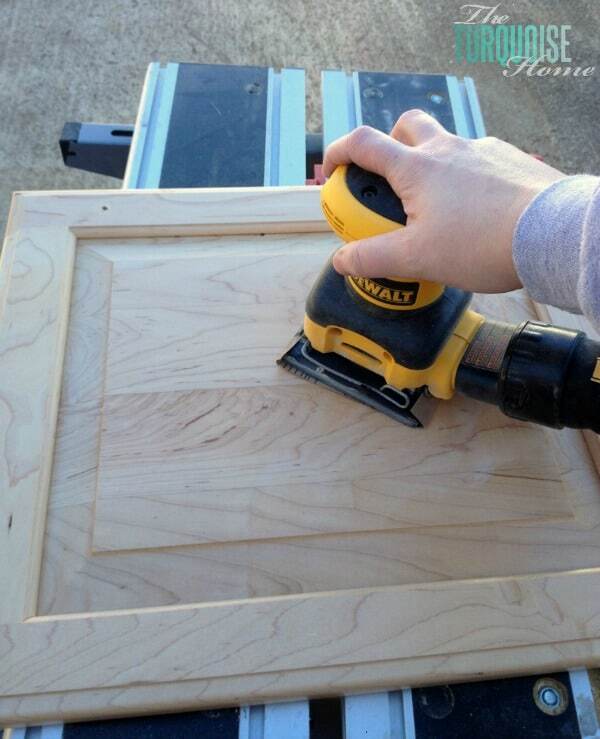 If you have any rough spots or drips or runs from the primer, then sand them very lightly using some fine sandpaper. You don’t want to knock off the primer. I didn’t need to sand because I used my trick to get a smooth finish. After all of that prep work, which feels like it will go on forever, it’s finally time to paint. Hallalujah!! I start with the backs of the cabinets and paint all of the coats that I’ll paint on them. So if I’m doing 2 coats, then I paint 3 coats on the back and then move to the front. That way when I flip them over to paint the front, then if it gets messed up, it’ll just be the back. No problem. On the front side, I paint the beveled areas first with a brush (purdy brushes are my fave! ), and then I paint the flat areas with a foam roller. This helps minimize the brush strokes and potential drips or pools of paint. You will want to make sure not to use too much paint so that it pools up in the corners. No worries – my cabinets aren’t gray. 🙂 I grabbed this picture from when I painted my bathroom cabinets. 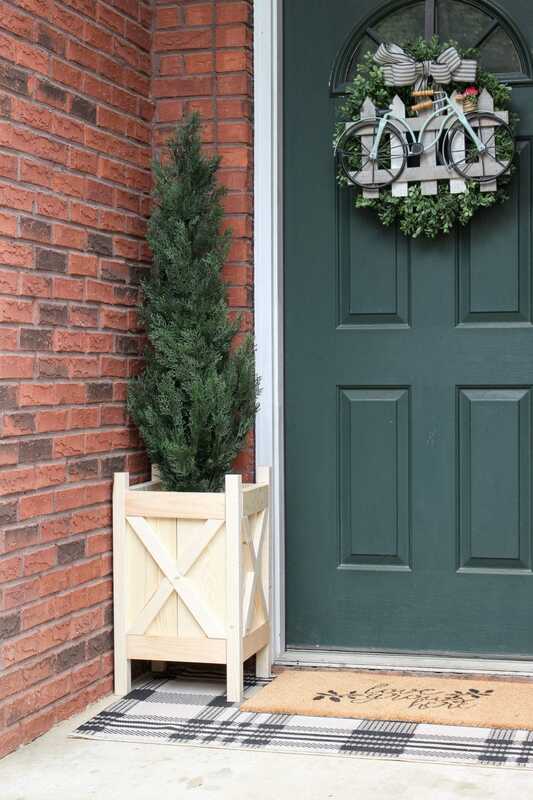 Follow the instructions on your paint for when you can apply a second coat. Wait that amount of time before you check for drips and lightly sand to minimize them. I had a couple of spots from painting the first coat that I had to sand down. If there weren’t any trouble spots, I skipped the sanding. Step 12: Repeat steps 10-11. My cabinet doors needed 3 coats of paint, so just gauge how they look after 2 coats and then decide if you need more or not. Let them dry and then re-hang them! Woohoo! I was so excited to get my doors back on in time for Christmas. I was insane to tackle them during the holidays, but the pain and sruggles were worth it! I’m so happy to check this project off the list that’s been hanging around for 4 years!! Do you have any advice for painting cabinets, like getting your best friend to move in with you to watch your kids so you can finish quicker? Or warnings about what to avoid, like be sure to use paint conditioner so you don’t see paint strokes? 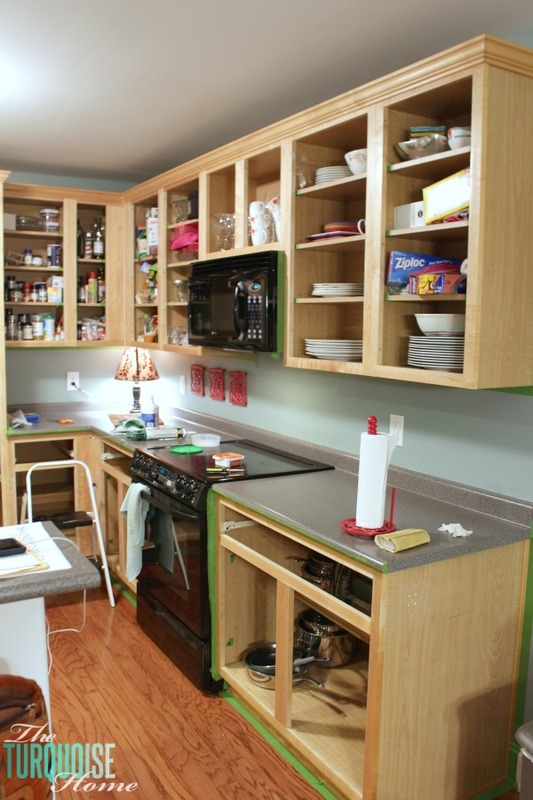 i am painting my cabinets now…when I’m on the FINAL coat of my finished color, do I sand it one last time? Won’t that leave a dull finish where I sanded? I’m concerned that I will have brush strokes still visible and need to sand, but then you will see the spots I sanded. Make sense? I’m only on coat 2 so maybe by coat 3 or 4, I won’t need to sand the finish. great detailed tutorial. It turned out great. We painted our cabinets as well, but with a sprayer. What finish did you use for the paint? Satin or semi? I believe it was semi-gloss! Thanks for sharing your experiences. I’m doing some research on painting. I have an old coffee table and I want to paint it. Now I know how to do that. I am planning to list my condo and the kitchen has maple cupboards. I’ve been thinking of painting them and read your post with interest. 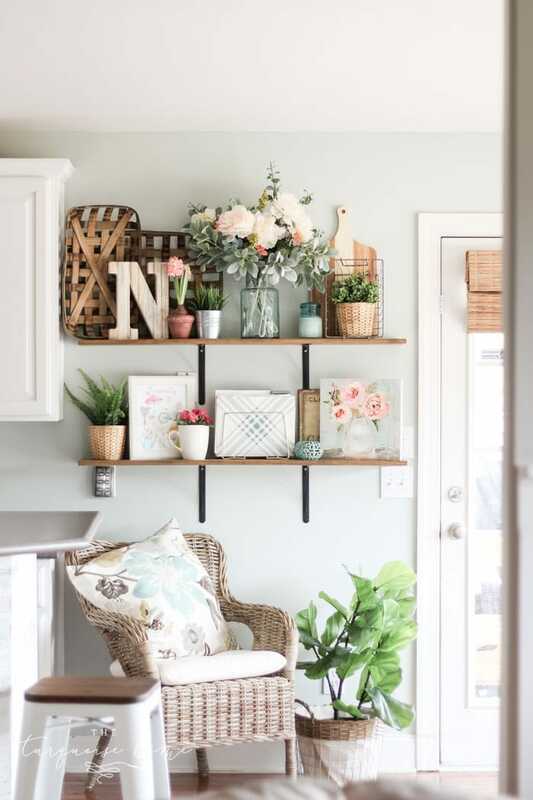 I love the look of your white cupboards and appreciate your tutorial. I must confess, however, that it is more work than I realized. Are there any shortcuts? For instance, when I painted my kitchen, I had used the non-toxic non-smelly Benjamin Moore paint that was paint and primer all-in-one. It covered well and didn’t smell. Do I really need to remove the cabinet doors if I paint very carefully and cover the counters/appliances/floors? Can I use a paint that includes a primer? Do you know anyone who has used shortcuts? Thanks so much!! Hi, thanks for posting. I am currently painting my kitchen cabinets now. Sanded, primed and painting with BM advanced as well. Do you think polycrylic or polyurethane is needed as an extra protection? Hi Teressa, it’s my understanding that BM Advance paint does not need a top coat. So I didn’t use one. I’ve also heard (and experienced) that polycrylic can yellow over time and I’d hate for my white cabinets to turn yellow. 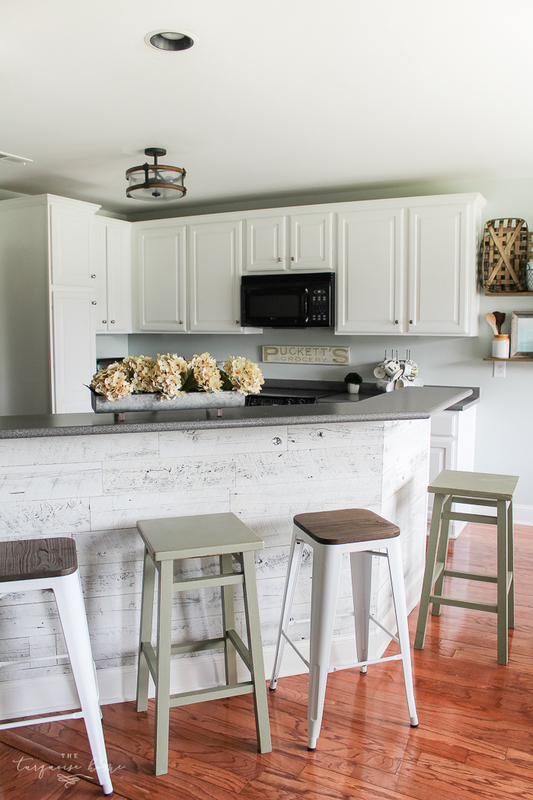 i love your kitchen cabinet colors but I also want to know where you purchased your bar stools from. Love the color. Incredible and beautiful. Great job and thanks for in depth sharing. This turned out fantastic, and it looks so professional! The color makes the whole room look much lighter and gives your kitchen a whole new look! 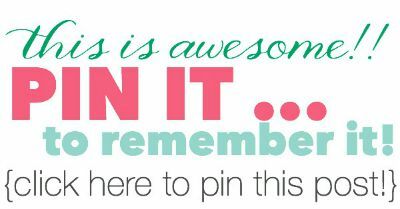 I am definitely saving this for when we redo our own kitchen!